Clermont Auvergne are on the verge of an injury crisis in the front-row following the news that David Zirakashvili has fractured his arm. The Georgian prop limped from the field in the 37th minute against the Leicester Tigers and scans have revealed that he has fractured the radius in his forearm. He will undergo the surgeon's knife this week and is expected to be out for two months. Clermont are already without French international Thomas Domingo for the rest of the season and Lionel Faure was ruled out of the clash with the Tigers due to a thigh injury. 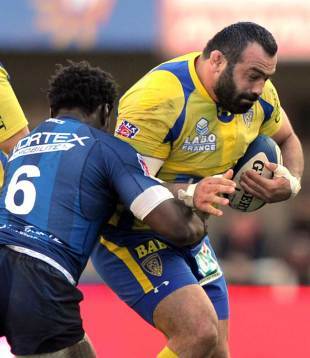 Following Martin Scelzo's departure to Agen at the end of last season, Clermont are left with four fit props: Vincent Debaty, Danie Kotze and youngsters Clement Ric and Raphael Chaume. However, Clermont's backs are firing and Wales fullback Lee Byrne is hoping to draw on previous experience against the Tigers at Welford Road this weekend. "It's going to be a tough trip and we need to recover well. They are a quality, well drilled team and they showed that when they scored their first try against us," said Byrne. "We are happy with the win and to feel disappointed about not scoring four tries against Leicester means we have to be doing something right. Winning was the key thing for us and it means there is all to play for next week. "The spirit here at Clermont is excellent and the fans are fantastic. Playing in Wales I heard stories that the French don't take the Heineken Cup seriously. But being at Clermont I now know how seriously they take it and how much they want to win it. The ambition here is great and, hopefully, we will be pushing for that and the Top 14."